The two most important points are concise style and active voice. Both of these habits are critical for SEs to write concise emails, specs and commit messages. You will even see improvement in more casual day to day interactions (via slack, SMS etc). >I took a moment to recollect the last 18 hours as I had accepted the seemingly random last minute invite to the New Years poker party from a former colleague who had moved on a few months ago. >Little did I know that night would spark something within me, and with just one, two, seven deposits of $100-200 on Pokerstars I would soon be funding a poker trip to feed the soul of my competitive being. If your work is free of grammar and spelling errors you're probably ahead of most of your classmates right there. You might read some books about writing like The Elements of Style. The only writing I've done professionally was for TV news. I read exactly one book on the subject, Writing Broadcast News by Mervin Block (he wrote for Cronkite). It's basically the Bible of broadcast writing and it was very instructive. I've given away more copies of that book than any other. Improves all relationships. I'd prefer they not only read Elements of Style, but work on it. Is this the book you recommend? I see what you mean by being an aggregation and I guess in my case, unless I start studying in a field of astrophysics or any other, there is no way out. The gold standard for this sort of thing is going to be A Pocket Style Manual by Diana Hacker and Nancy Sommers. 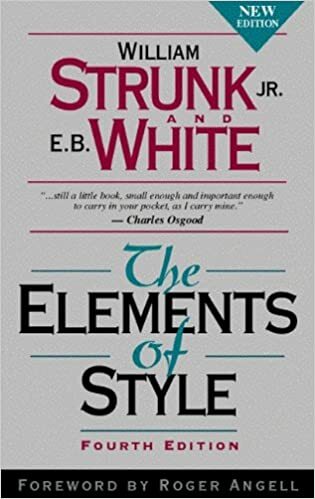 You would also do well to pick up The Elements of Style by Strunk and White. ^^ I came here to say this .